As I was driving home this evening, I had one of those wonderful moments when you suddenly see something that you didn't see in the moment itself. Earlier this past week, a BU Catholic Center seminarian was in town and we met up for lunch. Today, another BU Catholic Center seminarian, his family, and I had Mass together. This afternoon, I found out that a man who was part of the BU Catholic Center in 2011 is now entering religious life. Another man who graduated this year is also entering religious life. 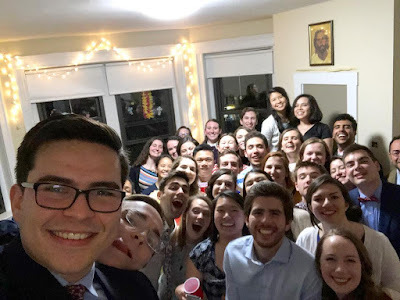 This evening another BU Catholic Center seminarian who has been studying in Rome for the past two years came for Mass and dinner. When I dropped him back at the seminary, I ran into another BU Catholic Center seminarian. It wasn't until I was driving home that it dawned on me how amazing all of this really is! Today, in the Gospel of Mass, Jesus spoke about how the Kingdom of God is like a man who sows seeds, but then he really doesn't know what happens after that. They take root, grow, and are fruitful. But the fruitfulness is all God's work. As I was driving home tonight, I thought about how all of these men who are in the seminary are signs of the fruitfulness of the Kingdom. In each of their lives, various persons--priests, brothers, sisters, lay men and women, fellow students, all scattered seeds. The BU Catholic Center community is a place where people scatter the seeds of the Kingdom. None of these people knew what the result of their labors would be. They just scattered the seeds because that is what the Lord asks of his disciples. There are many things that a parish or community can do to promote priestly vocations, but none of those things--or even ALL of those things--will produce the fruit. All we can do is to sow seeds and hope that the Lord will make them fruitful. No priest, parish, vocation director, or community produces priestly vocations. 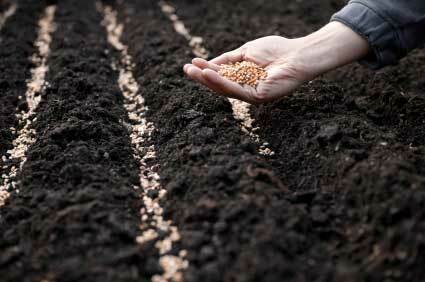 But, every priest, parish, vocation director, and community can sow seeds. It would frankly be kind of boring if priestly vocations arose from a program or from a clever plan. There would be no surprise to it. What is beautiful about the Kingdom is that we scatter seeds, but we don't really know how those seeds become fruitful. The seed sprouts and grows, but we know not how. It is a work of Divine Grace. The Kingdom of God is so extraordinarily beautiful because we can't make it happen. We are servants of the Word, not masters of the Word. It's always a surprise when the fruits of the Kingdom burst forth in our midst. The Kingdom of God can't be managed, bureaucratized, or programmed. We scatter seeds. God makes them fruitful. Part of the joy of the Christian life is the recognition that we have been permitted to participate in something so much greater than ourselves. I am filled with gratitude as I end this day. I have always loved today's parable, but today I saw it play out before my eyes. Day in and day out for years, people at the BU Catholic Center have been scattering seeds, and those seeds have taken root, sprouted, grown, and have borne fruit. But, none of us is able to take any credit for it. If we could take credit, then we could be certain that it is not the Kingdom. What is so awesome is that we all have the privilege of seeing God produce fruit from our meagre efforts. He is so faithful! God takes the little that we offer and he transforms it into something spectacular. Tonight, I am grateful for those who scatter seeds and for the Lord who causes those seeds to take root, sprout, and bear fruit.